His news as I have stated when I started compared to mine was/is joke(is a regular scam artist who was used to boost/inflate Russian lies). There is tunnel under this embassy which was/is used by Assange. This was at least CIA's information given to me and I repeat one again. I CALL JOURNALISTS TO CHECK AND SEE WHAT SITUATION IS. Assange's involvement in world of affairs was crucial for anarchy(destabilization of the world) used to place Trump in the white house as well as for Russian aggression(occupation) of Ukraine. 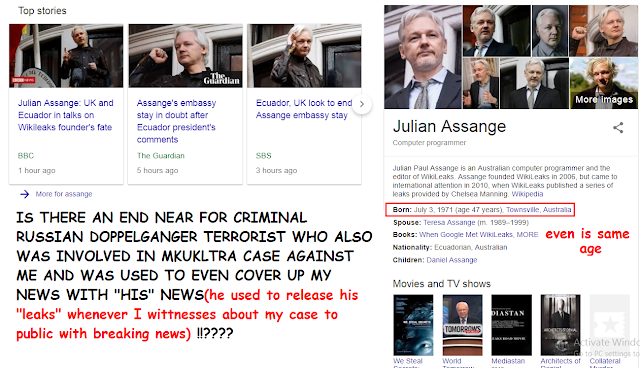 Assange became multimillionaire via bitcoin investments(again related to Russia). Speculation is swirling over Julian Assange’s future after Ecuador’s president said he must ultimately leave the country’s London embassy, where he has lived for six years. Lenín Moreno’s comments about the Australian-born WikiLeaks founder, made at an event in Madrid, follow reports that discussions were held between senior officials from Ecuador and Britain about how to remove Assange from the embassy if his asylum were revoked. Assange was granted refuge at Ecuador’s embassy in 2012 while he was on bail in the UK over sexual assault allegations against him in Sweden. The Swedish criminal investigation was dropped in 2017, but the British arrest warrant for breaking his bail conditions remains active. Assange and his supporters believe being taken into custody by UK police would pave the way for his extradition to the US to face trial for WikiLeaks’ publication of US diplomatic and military secrets. The embassy cut off Assange’s internet connection, computers and phones several months ago, although he still speaks to his lawyers. In May, Moreno ordered the withdrawal of additional security from the building. The Intercept news website reported that Moreno, who has previously described Assange as an “inherited problem”, was close to evicting him from the embassy. A source speaking on condition of anonymity told Reuters: “The situation is very serious. Things are coming to a head.” He described the state of affairs inside the embassy as “not looking good”. The Ecuadorian and UK governments have downplayed suggestions of Assange’s imminent removal. In a statement before Moreno’s comments, Ecuador’s foreign ministry said: “The Ecuadorian state will only talk and promote understandings about Mr Assange’s asylum, within the framework of international law, with the interested party’s lawyers and with the British government. The UK Foreign Office minister Alan Duncan told parliament last month that the government was increasingly concerned about Assange’s health. “It is our wish that this is brought to an end, and we would like to make the assurance that if he were to step out of the embassy, he would be treated humanely and properly,” Duncan said. The UK Foreign Office declined to comment.